A new initiative empowers citizens to submit and rank questions for the president to answer. President Obama takes questions at a town hall meeting in Costa Mesa, Calif.
Editor’s Note: The Nation is leading a new initiative, “Ask The President,” to advance citizen questions at President Obama’s press conferences. You can submit and vote on questions here. On his first day in office, President Obama pledged to make his administration “the most open and transparent in history.” Americans can already see more of their government–from splashy slide shows of Oval Office meetings to newly declassified memos about the executive’s wartime powers. Unlike Obama’s dynamically interactive campaign, however, WhiteHouse.gov does not foster much meaningful dialogue with citizens. At least not yet. Obama can go much further to deliver on his promise. He took a small step in February by fielding a question from a Huffington Post reporter at his first press conference. Yet advancing a connected, engaged citizenry requires more than acknowledging the rise of online media. Here is one tradition that Obama could start: invite new and independent voices into the East Room by pledging to take a citizen-generated question at every prime-time press conference. To put this idea into action–and give the busy White House something tangible to work with–The Nation is teaming up with a broad coalition of new and traditional media, including the Washington Times and the Personal Democracy Forum, to begin gathering questions from you, the public. The coalition is inviting people to write in questions or submit them as videos. Participants can see all the questions on the site and vote on the ones the president should answer. The system allows only one vote per question from each Internet IP address, but there is no limit on how many questions people can support. The portal also enables anyone to embed questions on other websites. So after posting a question about bank nationalization, for example, a participant can then link to that question on another site–a blog or news site–and appeal to others to back it. After public voting, the coalition will select and send a credentialed journalist to attend the next presidential press conference, ready to choose from the list of the most popular citizen questions. (This journalist would focus only on these questions from citizens and would not reduce the time available for the standing pool of White House reporters.) The precise question will not be announced in advance, though the choices will obviously be public. At the press conference, the journalist can choose from the top questions, prioritizing a topic that is substantive, factual and that has not already been addressed by the president. This assumes, of course, that President Obama agrees to participate. The East Room press conferences are among the most exclusive and least democratic public gatherings in American politics; the White House controls who attends and who gets called on. So the coalition is appealing directly to the Obama administration to admit and call on the journalist armed with citizen questions. Obama has repeatedly pledged a more innovative, interactive government. Wide public engagement in “Ask the President”–and strong political support for Obama’s participation–can make that pledge a reality. Obama’s team is likely to welcome this idea. After all, some of the best precedents for it come from the 2008 campaign and Obama’s innovative transition website, Change.gov. Of the thousands of queries lobbed at the candidates during the presidential campaign, one of the most influential questions was whether candidates would meet with the leaders of Iran, Syria, Cuba and North Korea without conditions. Few observers appreciate, however, that this diplomatic challenge came from a regular citizen, Stephen Sorta of Diamond Bar, California, during the 2007 2007 CNN/YouTube debate. Tapping that kind of citizen input is valuable, explained a CNN executive who oversaw the debate, because people can pose “straightforward, interesting questions that the mainstream media couldn’t–or wouldn’t–think to ask.” During the primary Obama also responded to a citizen question about broadband policy, which had received the most votes at TenQuestions.com, a national, nonpartisan project backed by the New York Times editorial board and the Personal Democracy Forum. Then, after the November election, Obama’s transition team invited citizens to submit and vote on questions at Change.gov, pledging that the top queries would be answered by his staff. The response was huge. About 120,000 people wrote more than 86,000 original questions, and millions of votes were cast. That kind of constructive, active participation is great for civic interaction with government, and it ended up advancing accountability, too. Press Secretary Robert Gibbs, to his credit, answered several of the citizen questions on Change.gov, but he also ignored the one that drew the most support, about investigating torture and surveillance abuse. Within days, however, ABC’s George Stephanopoulos pressed Obama to address the unanswered question in an interview, citing its strong public support. The question platform empowered citizens to put a topic on the national agenda by demonstrating how many people wanted an answer. And the administration’s public dodging actually sent the issue trickling up, since Stephanopoulos used his access to amplify other people’s voices. Some observers may protest that the media already fixate on what “ordinary Americans” think. True, but usually in a very different way. Take NBC chief White House correspondent Chuck Todd, who recently told C-SPAN that his goal during presidential press conferences is to ask the questions on the minds of everyday Americans. A worthy objective, but what is his method? Reporters often present snapshots of national priorities by citing survey data or gathering anecdotal responses to questions on current events. Few traditional mechanisms, however, capture the public’s active interests–empowering people to draft their own ideas, concerns and questions from scratch. Generating and debating new questions is fundamentally different from picking among a scripted menu (as the previous question experiments demonstrated). And virtually no traditional media mechanisms couple that original, individual production with transparent, national voting. Doing both can broaden the issues under public discussion while weighting their priority according to public input–a useful service for our body politic. With widespread participation, this citizen-driven portal would not only affect Obama’s press conferences; it could also grow into a dynamic, data-driven information resource, demonstrating trends, input and ideas to guide journalists on an ongoing basis. These forays are positive, if they reflect a genuine receptivity to deeper citizen input in journalism and government accountability. Yet they offer no reliable metrics for pooling or assessing public priorities. They are not transparent, either, since there is no unified structure displaying how many people drafted questions, or what other citizens think of them, or whether a reporter’s selected questions are representative of those submitted. As a largely one-way circuit, such efforts are less likely to foster public debate or spark sustained citizen participation. Tightly controlled government portals can be a fairly closed circuit, too. People deserve forums that are free, open and interactive. 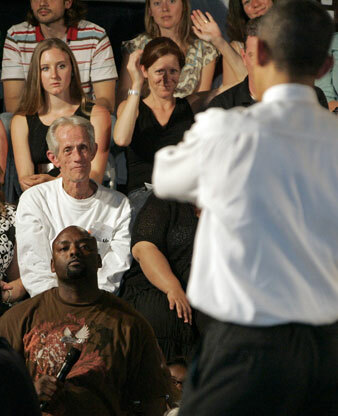 Now, if Obama decides to answer the leading citizen questions in another forum–say, in a town-hall event or web video from the road–that would be a start. The “Ask the President” model, however, is more independent than controlled interaction on government websites, because officials are not picking the questions or prerecording responses. The top questions would be known to anyone who cares to look, but the process would be independent, and the question would be posed live for the president’s response. It is past time to develop more formal, accountable platforms to channel America’s tremendous civic energy. Given today’s technology and rapid innovations in participatory media, why shouldn’t citizens have some regular route to questioning the president? President Obama has already led several innovative reforms in this direction. He overhauled freedom-of-information policy, launched Recovery.gov for accountable stimulus tracking and even created a White House director of citizen participation, filling the position with an executive from Google Moderator–the technology behind the question platform at Change.gov. The transition team’s call for citizen questions was also intriguing, though the program has not been used since the inauguration. And even when it was running, of course, Change.gov sent questions only to press staff, not to Obama. When it comes to advancing interactive access to the White House, we may need to take the lead. The traditional press can cooperate with this modest experiment, engaging the ideas, concerns and experiences that the public brings to the questions facing our government. Reporters should not wait to be dragged toward participatory innovation by more creative audiences. The recent record shows how participatory and traditional media can work symbiotically, not only in activating enthusiasm for politics–a civic boon in its own right–but also in broadening and advancing the kind of robust inquiries at the core of traditional journalism.